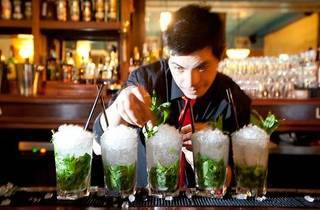 Since it opened in 2011, this well appointed ’50s-Cuban-themed joint opposite the QVB (and just around the corner from newcomer Lobo Plantation) hasn’t quite grown into its massive floor space. Visit there any time before Friday night, and you’re likely to find the place awkwardly empty. But for city slickers looking for a quiet, affordable after-work meet-up involving rum and tapas, this is the place. 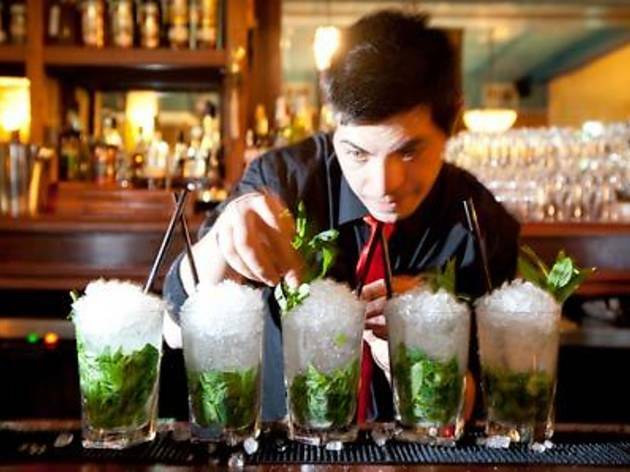 The well-dressed bar staff are friendly and helpful, the food is good, and we challenge you to find a cheaper Mojito in Sydney than the six dollar happy hour special, which runs Tues-Thurs, 5-7pm. If you’re feeling flush, however – or prefer your drinks less sweet – we suggest tipping your hat at Hemingway’s tipple of choice, the Hemingway Special (AKA the Hemingway Daiquiri AAKA the Papa Doble): here, Havana Club rum is shaken with fresh lime, grapefruit juice and maraschino liqueur. It’s practically a health shake, right? The bar menu is on the pricey end of the spectrum, but a gratifying cut above the usual bar snacks: croquettes de carne served with lime and chilli marmalade, corn pancakes with Brazilian catupiry cheese and mushrooms, rice and black beans with pork rind and quail egg. On our visit, we settled for rum-resistant three-cheese empanadas with quince relish, and taro croquettes with chilli sauce, beautifully presented with a nest of cucumber zest. It’s BYO fun at the Cuban Place. They supply the food, hooch and roof, you supply the good times, everybody’s happy.